The Three of Cups will combine the qualities of both the Ace and the Two of Cups. The undirected love has found its goal, it will grow and blossom. The 3 (triad) as the number of synthesis and harmony will pour its riches into the seas of Binah, the understanding and realization. 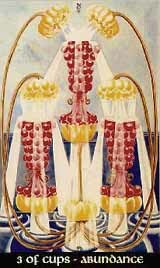 Therefore, the Three of Cups shows that we have found joy and fulfillment in love and devotion, we are aware of the worth and understand its meaning.